Two close-range efforts by the Premiership's leading try-scorer Waldrom were reward for a spirited display and gave the scoreline some respectability. But Saracens were far superior, managing the difficult conditions brilliantly and scoring some breathtaking tries to earn a deserved victory that sees them close in on a home play-off semi-final with just four games to play. 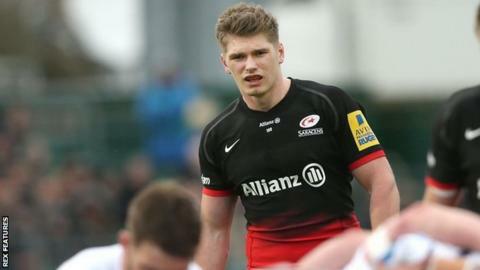 Saracens welcomed back Grand Slam winners Billy and Mako Vunipola, Maro Itoje, George Kruis and Farrell, as well as Scotland's Duncan Taylor. They all made significant contributions, but it was Farrell's ability to dictate play from fly-half and the younger Vunipola who impressed most. Farrell masterminded the tight, close-running rugby before the break and then showed his ability to run cutting lines as he burst through to score the third try, before teeing up the fourth score with another swift break. And Billy Vunipola's devastating mix of powerful running, big-hitting and top-quality handling at number eight was also key to the victory. Vunipola crashed over for the second try, muscling his way through Olly Woodburn and crossing from five metres after a delightful one-handed offload by Marcelo Bosch. In the second half they played for position more, mixing things up when required with an astute kicking game. Their tight running game was typified by their two first-half tries as they kept ball in hand centrally to advance deep into Chiefs territory before sucking in the defence and crossing the line. Sarries' first try saw them make 70 metres and, when the ball was recycled quickly, Goode was able to wriggle away from a couple of challenges and lunge for the line to mark his 200th appearance for the club with a try that set the tone for an impressive win. "It says a bit about Owen, having not played at 10 for eight or nine weeks, to produce that kind of performance. "That goes for all of our international players. To win a Grand Slam and the high of that, and then to turn in the performance they all did says something about them. "Playing into that strong wind in the first half, it was kind of as good as it gets. "Overall, it was a brilliant performance." "We had the elements with us in the first half, and we needed to capitalise on that, but we didn't at all. "We lost ball too easily, and we didn't really get through any kind of phase-play and we didn't exert too much pressure. "The easiest way for me to wrap it up is to remind the players of the bigger picture. "Individual games between top-four sides don't always carry the weight that they feel they do at this time of year." Saracens: Goode; Taylor, Bosch, Barritt (capt), Wyles; Farrell, Wigglesworth; M. Vunipola, Brits, Du Plessis, Kruis, Itoje, Wray, Fraser, B. Vunipola. Replacements: Saunders, Barrington, Lamositele, Hargreaves, Brown, de Kock, Tompkins, Ellery. Exeter Chiefs: Dollman; Woodburn, Slade, Whitten, Turner; Steenson (capt), Lewis; Hepburn, Cowan-Dickie, Williams, Parling, Welch, Ewers, Salvi, Waldrom. Replacements: Taione, Moon, Low, Atkins, Horstmann, Chudley, Hooley, Bodilly.